1. 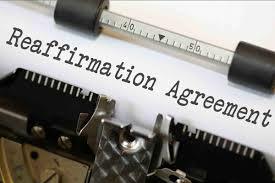 All Reaffirmation Agreements must be filed using Official Form B427, the Reaffirmation Cover Sheet. 2. All Pro Se Reaffirmation Agreements that do not involve credit unions or real estate will be automatically set for hearing, regardless of whether a presumption of undue hardship has arisen. If the Reaffirmation Agreement involves real estate and/or a credit union, no further action will be taken. 3. The Reaffirmation Agreement Form (Official Form B2400A/B ALT) is divided into the following parts: Parts A-E - consisting of the Debtor’s Disclosures, Reaffirmation Agreement, Attorney Certification, Debtor’s Statement in Support of Reaffirmation, and Motion for Court Approval make up the document required to reaffirm a debt. Instructions for completing the various sections appear within the Reaffirmation Agreement form. Part A - Debtor’s Disclosures: Summary of Reaffirmation Agreement. This section gives details about the agreement such as the amount to be reaffirmed, the percentage interest rate, the monthly payment to be made. Part B - The Reaffirmation Agreement Requires signature(s) of both the representative of the creditor and the debtor(s). Part C - Certification by Debtor’s Attorney - only applicable if represented by an attorney.